October's at once my favorite and most dreaded month. I love its gold-drenched splendor even as I sorrow for the end of summer's pleasures and the onset of winter's privations. Since nomadic cultures have always enthralled me, Carman's lines came as a piquant surprise when I discovered his poem a couple of weeks ago. Most of what I've been watching and reading lately deals with wanderers; just now it's documentaries about the roving tribes of today's Rajasthan and the steppes of Central Asia, and memoirs by Himalayan explorers from Queen Victoria's time. Given such exotic reality, writing fiction has been difficult. 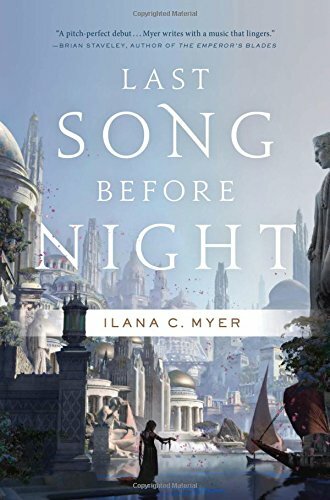 Others, however, have been spinning wondrous yarns, in particular my friend Ilana Teitelbaum (pen name Ilana C. Myer) whose debut epic fantasy Last Song Before Night is fresh off the presses and reaping richly-deserved critical acclaim. Synopsis and first chapters can be found here, and clicking the lovely cover links to Amazon.com. An enchanting world awaits.